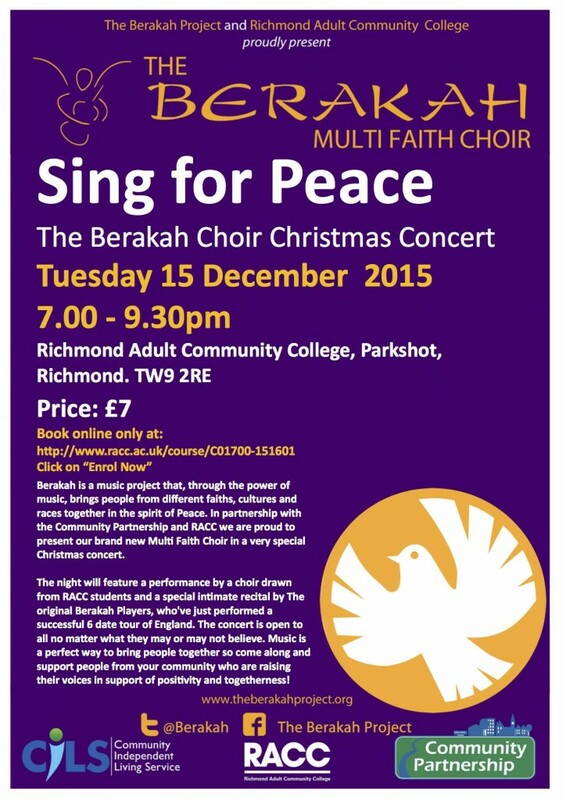 “Sing for Peace” – The Berakah Multi Faith Choir Christmas Concert. Berakah is a music project that, through the power of music, brings people from different faiths, cultures and races together in the spirit of Peace. In partnership with the Community Partnership and RACC we are proud to present our brand new Multi Faith Choir in a very special Christmas concert. The night will feature a performance by a choir drawn from RACC students and a special intimate recital by The original Berakah Players, who’ve just performed a successful 6 date tour of England. The concert is open to all no matter what they may or may not believe. Music is a perfect way to bring people together so come along and support people from your community who are raising their voices in support of positivity and togetherness! You will be asked for payment on line and your full contact details before you can proceed.